Pasta is a comfort food at our house! Sometimes we have to wait for it, like when we make Crock Pot Baked Ziti. That’s an easy to make recipe, but you have to plan ahead! Other times I make Zucchini Noodle Alfredo. And, although I truly love this recipe and it is ready in minutes, there is no traditional pasta involved. On the other hand, this pasta dish is ready before you can say let’s eat out and is pretty healthy in my book. I use whole wheat noodles which contain lots of fiber. Use your favorite pasta, including gluten-free or with added veggies or protein. They all work in this recipe. The pasta is bathed in olive oil and sauteed garlic (no cream at all!.) It’s also a great opportunity to use roasted garlic cloves stored in the freezer. There’s a whole pound of mushrooms…enough to have one with every bite and mushrooms are very filling and healthy. Fresh basil and freshly shaved Parmesan cheese finish the dish. Even though it only takes about 25 minutes to make, start to finish, dinner takes on a special, out-to-dinner feel. Everyone at my house would agree with that assessment. “Spaghetti night” is very popular! Yet, each family member would put their own little spin on my version of the perfect pasta, known as Spaghetti Aglio e Olio in Italy. My sweet darling who is allergic to dairy would sprinkle a vegan substitute over the top or she might skip “cheese” altogether. Sometimes I add some diced chicken sausage or some other meat to boost the protein. My other darling daughter could do without the “green stuff”…and would probably heap on a whole lot more Parmesan than what you see here. I can’t blame her. Fresh shaved Parmesan cheese is de-lovely! Everyone enjoys a little bread on the side. And, there are plenty of leftovers for lunch the next day! Since I’m the chef around here and I love mushrooms, I added a heaping amount of baby bella and white mushrooms when I was sauteing the garlic. But, you could certainly go an entirely different direction with this by adding…Zucchini? Asparagus? Spinach? Tomatoes? 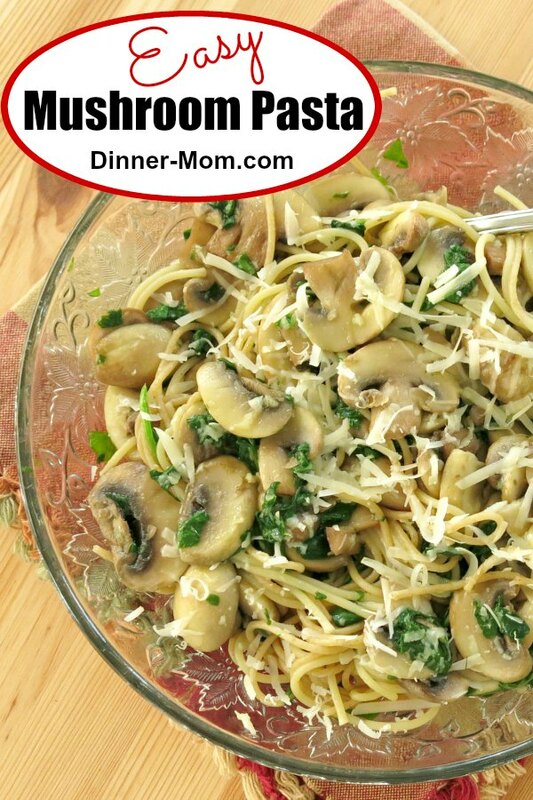 This simple dish of pasta with olive oil, garlic and mushrooms will have dinner on the table in less than 30 minutes. But, you'll want to savor every bite. Cook spaghetti according to package directions, reserving a quarter cup of the pasta water. Add garlic, mushrooms and salt and saute for about 5-7 minutes. 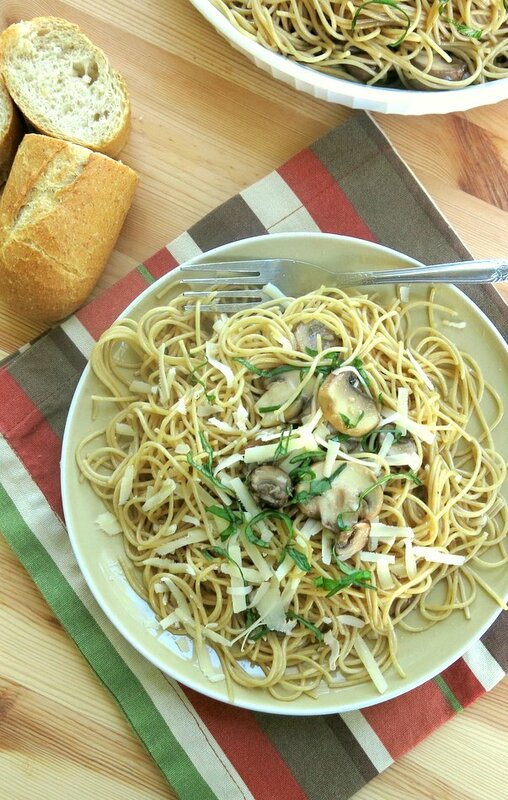 The mushrooms should be soft and the garlic golden. Add the reserved pasta water to the pan and stir to incorporate. 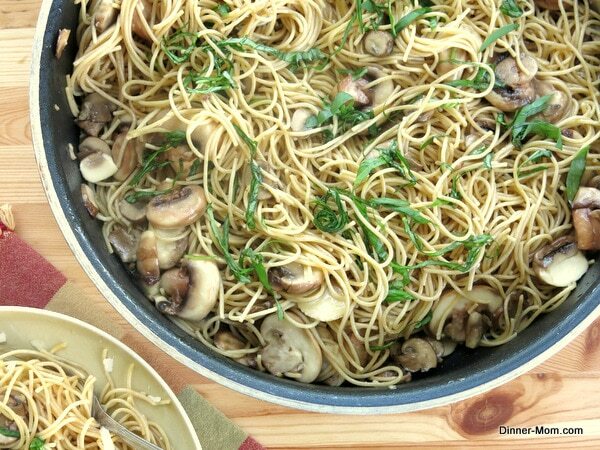 Add drained spaghetti noodles to the skillet and stir to coat with olive oil mixture. Top with basil leaves and Parmesan cheese, if using. I love the flavours that went into this quick and easy dinner dish. 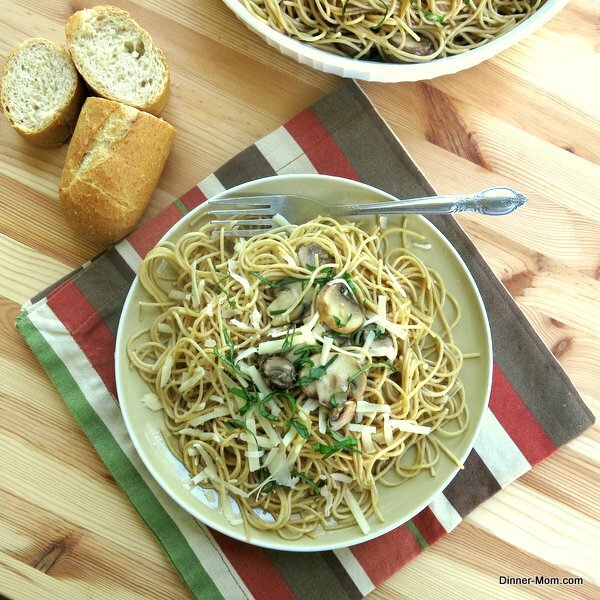 Mushrooms bring an earthiness to the pasta that always seems to compliment it so well. Thanks for sharing, I’ll be making this soon! Wow – I love this dish! Simple but wonderful flavors! I love the simplicity of this dish. It really lets those amazing flavors of garlic, mushroom, and basil shine. And I’d take any extra mushrooms too! I love the simple ingredients that Italian food can elevate to something special–and this is definitely one of those instances. 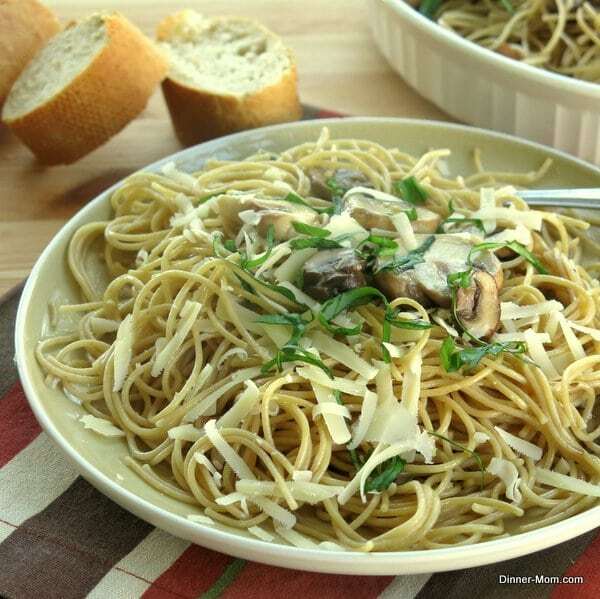 The salty cheese, the great texture of the mushrooms, and the chewiness of an al dente pasta are all hard to beat. Looks delicious! 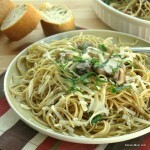 I love simple pasta dishes like this, especially ones that have mushrooms. I’d definitely take the extra mushrooms too! Sometimes all pasta need is to be cooked in some nicely salted water and little extra sauteed goodness to be perfetto! Oooooh the mushrooms here are the PERFECT touch! Looks like a great comfort food meal! This was a great simple recipe. Thanks! I just made this for tonight’s dinner and it is AMAZING…such simple ingredients with staples that we usually keep around the house. Followed the directions as is but added some leftover chicken breast that needed to be eaten and used a garlic/herb blend since I didn’t have any basil. It will definitely become part of our dinner rotation! I’m so glad you enjoyed it! It really is adaptable for other vegetables (spinach, asparagus) and proteins (chicken sausage, tofu, meatballs)!